The Memorial Bridge is a vertical lift bridge in which the lift operation provides a repeatable, controlled excitation applied only to the bridge structure on random schedule, requiring for measuring cyclic response (strains) for fatigue studies. 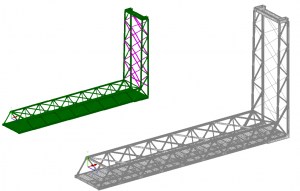 In addition, the gusset-less truss connection is unique to this bridge and is the only connection of its kind in a vehicular bridge, which makes the verification of the design procedure vital for future applications of this connection type. The limited information about the performance of the gusset-less connection, the influence on the global behavior of the bridge, lack of detailed information on load rating in the current codes raise the demand for a comprehensive monitoring program. Other challenging issues in the bridge such as the vulnerability to potential damages, fracture critical locations, and fatigue crack initiation and propagation under various service loads including traffic live load, lift operation impact and environmental loads can be addressed through a long-term monitoring program. The installed monitoring plan on the Memorial Bridge designed based on achieving a profound understanding of the gusset-less performance by installing a cluster of sensors at the connections. Data based fatigue assessment approaches are capable of determining only remaining life of the components which are instrumented with sensors. 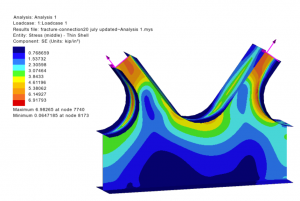 Determining all critical locations prone to fatigue merely through monitoring demands for virtual number of sensors which is not applicable for large-scale bridge structures. Therefore, given the practical restrictions of sensors deployment in real-field situations, finite element models have the distinct advantage of giving the exact positions, directions, and magnitudes of high stresses and the patterns of stress distribution in the entire zone of interest. Providing a global model of the structure can yield valuable information on required scale which can act as a benchmark for future damage assessment of the structure. In addition, the model when calibrated and updated through monitoring data has the advantage of to be employed to explicitly diagnose the root reason of detected abnormal behavior of the bridge as well as identifying the impact of such changes on the entire performance of structure.